These flavored oil recipes are incredibly easy to make! Extra virgin olive oil has a stronger oil flavor and is the most popular choice, or you can use canola oil if you only want to taste the herbs and not the oil. You can really use just about any oil you prefer. Precision isn't necessary here in terms of measurements - feel free to experiment and tweak the recipes according to your personal preferences. When making your bottles, consider the presentation. Whole cloves of garlic and sprigs of herbs look more appealing and decorative than granulated items, so try to use them whenever possible. In fact, for most oils consisting of mainly granulated ingredients, it is almost always better to strain the solids out after a steeping period, leaving you with beautiful, clear flavored oil. Unless the recipe states otherwise, you may choose whether or not you want to heat the oil. Garlic oil is one of the most versatile flavored oils. If you are planning on storing it for longer than 2 weeks, practice safe food handling procedures and only use dried garlic products in making this. For further information on oils and food safety click here. Heat oil to just below a simmer. Add garlic cloves and poach them for approximately 20-25 minutes until tender and translucent. Take off the heat and leave in pan until the oil is cooled. Strain the garlic from the oil, divide between bottles. Pour the oil into clean, decorative bottles and seal with a screw top or cork. If dried garlic slices are not available, you can still make the oil using granulated garlic with the following procedure. Place granulated garlic in a small glass jar and add oil. Shake well and let stand, unrefrigerated, for two days. Pour oil through a strainer lined with cheesecloth into sterilized bottles and seal with a screw top or cork. Place dried ginger in a small glass jar and add oil. Shake well and let stand, unrefrigerated, for two days. Heat peanut oil, chili powder, and crushed red pepper to just below a simmer. Cook for approximately 10 minutes. Remove from heat and stir in sesame oil. Cool to room temperature, then cover and steep in refrigerator for 3 days. Pour oil through a strainer lined with cheesecloth or coffee filter into sterilized bottles and seal with a screw top or cork. Place nuts and 1/2 cup of the oil in blender or food processor. Cover and blend, or process, until nuts are finely chopped. Place nut mixture and remaining oil in glass jar or bottle. Cover tightly and let stand in cool, dry place for 1 week. Strain oil into decorative container and seal. Heat oil to just below a simmer. Crumble 2 of the peppers (including seeds) into the oil (you may want to wear rubber gloves as you do this) and poach them for approximately 20-25 minutes until tender. Take off the heat and leave in pan until the oil is cooled. Line a small strainer with several layers of cheesecloth and strain oil into a glass jar. 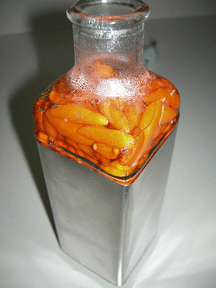 Pour the oil over the remaining peppers in a clean, decorative bottle and seal with a screw top or cork. Place spice in a glass jar and add oil. Shake well and let stand, unrefrigerated, for two days. Pour oil through a strainer lined with damp cheesecloth. Transfer oil to a clean, decorative bottle and seal with a screw top or cork. For this recipe, a little goes a long way, so you may want to use smaller bottles for gift giving. Remove stem and core of tomatoes. Halve, quarter or slice depending on shape you desire. If you halve or quarter, remove the seeds and watery pulp to speed drying. Combine the salt and herbs to make a seasoning salt. You may have to use more, depending on how large a batch you intend to make. Sprinkle the tomatoes with the seasoned salt. Use small amounts because it will concentrate as the tomato dries. Dry the tomatoes. For instructions for drying your tomatoes, click here. Place thoroughly dried tomatoes (under-dry is a safety hazard) in decorative jar or bottle. Fill with olive oil (or other oil). There are many other combinations, simply integrate ingredients with flavors that you think go well together. You can also experiment one ingredient at one time. Just be sure to follow all safety procedures!